Also consider another lesson: Stick with a subject. Do the reading. Show up. Preparing to meet with some journalism students, I began thinking: what is the main lesson of Atlantic Yards for journalists? "Go beyond stenography and be wary of manipulation." In other words, those with power to shape the agenda--generally, the developer and the government--are not necessarily giving it to you straight. So if you're just reprinting or summarizing their press releases, you're missing something. (Same goes for press releases from those opposing a project.) And so much of journalism relies on press releases. Such press releases are often massaged by well-compensated public relations professionals, some of them former journalists. Many in the press, stretched thin over numerous responsibilities, don't know the background. Conversely, those in power, in general, will not share information that doesn't serve their interests--not unless they're forced to, such as via a Freedom of Information Law (FOIL) request. To many people, watchdog reporting is synonymous with investigative reporting, specifically, ferreting out secrets. But there’s another, maybe even more crucial form of watchdog reporting, especially in this age of relentless public relations and spin. It involves reporting what may well be in plain sight, contrasting that with what officials in government and other positions of power say, rebuffing and rebutting misinformation, and sometimes even taking a position on what the facts suggest is the right solution. 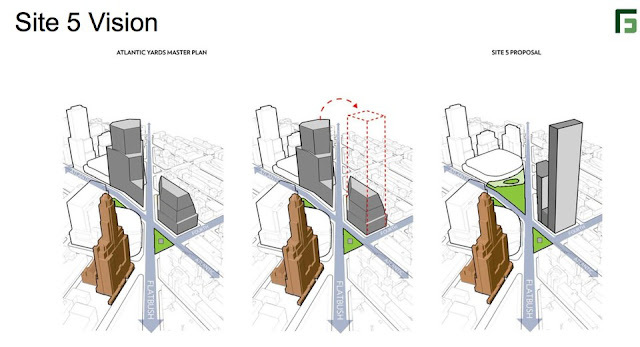 Consider these Atlantic Yards/Pacific Park examples. How affordable is the "affordable housing"? Consider the city's 6/12/17 press release for the grand opening of the "100% affordable" 535 Carlton. NEW YORK— Mayor Bill de Blasio, Deputy Mayor Alicia Glen, local officials, Greenland Forest City Partners and community groups announced the opening of 535 Carlton. The building’s 298 homes are all affordable, and reserved for New Yorkers with household incomes of between $20,100 for an individual and $149,000 for a family of three. But that press release obscured that half the building was designated for an upper "band" of middle-income households, earning far more than most people seeking below-market housing. That configuration departed considerably from the longstanding plans for that middle-income cohort to occupy only 20% of the overall affordable housing. We learned more about exactly how that press release came about thanks to a FOIL request (from NY 1 and the New York Post) regarding mayoral emails to consultants the mayor dubbed "agents of the city." But the configuration--and reason for skepticism--was obvious at the December 2014 groundbreaking. Then I followed up on a hunch and filed a FOIL request for the database of applicants, and spent a very long time (with some help) trying to analyze it. The conclusion: while a very large number of people applied for units at the building, very few sought those upper middle-income units, as I wrote for City Limits. What's going on at Site 5? It could be the biggest building in the entire project, and it's been almost completely under the radar, aimed for a site catercorner to the arena. But what did that mean? No government entity volunteered information, and the developer wouldn't share any details. It took my FOIL request to learn that GFCP had proposed four versions of a two-tower project, which at the time would've been Brooklyn's tallest building. The project has not yet moved ahead, because of a lawsuit from a current owner at Site 5--P.C. Richard--but likely will proceed in the next few years. So stay tuned. How successful is the arena? The Barclays Center has generally drawn kudos from architecture critics (with a few exceptions) and been honored in other ways. After just its second full year in existence, Barclays Center ranked in the top two of the highest grossing U.S. venues in 2014, according to the new issues of Billboard and Venues Today. In Billboard’s and Venues Today’s 2014 year-end reports, Barclays Center finished second in total gross of major U.S. arenas with capacities of 15,001 or more, and was fourth worldwide (Nets games not included). In addition, Pollstar ranked Barclays Center as No. 2 in tickets sold for U.S. venues. But the arena, after a very prominent debut year, saw a drop of 27% in total tickets sold, and 28% in gross revenue. More importantly, gross revenue and total ticket sales are incomplete metrics. 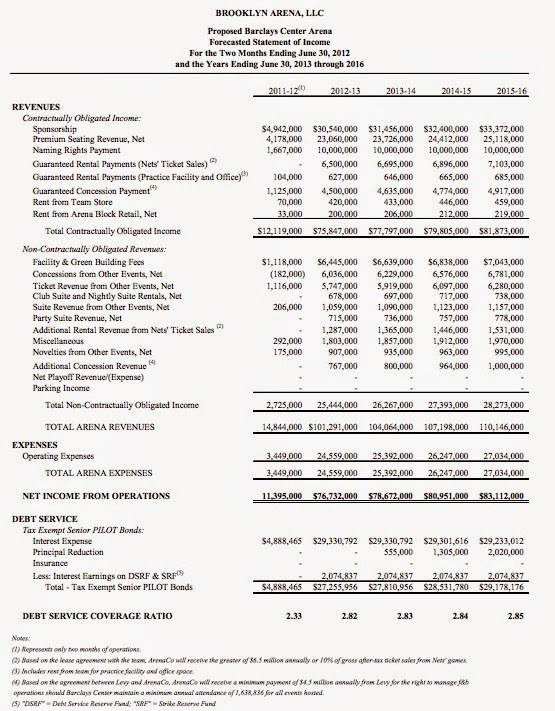 What was the net revenue, aka Net Operating Income, or NOI? That's used to pay off the annual payments in lieu of taxes, or PILOTs, which include the arena's construction loan plus a cushion used for operations and maintenance. And what's left is profit. We can debate how to assess profit, but this much is clear: bond documents predicted $83 million (for 2015-16) in NOI, and executives at Forest City Enterprises, over various periods, predicted $70 million, $65 million, and $55 million. They've never been close, as annual arena financial disclosures have shown. As I wrote last December for The Bridge, "Barclays in its last fiscal year—its second with the Islanders–suffered a 39% drop in net revenue, to $28 million, which then dwindled further after paying off construction debt." New Humanitarian had standard subjects, like history and math, and Danya had many hours of homework a week. But [school founder Vasiliy Georgievich Bogin added courses like antimanipulation, which was intended to give children tools to decipher commercial or political messages. He taught a required class called myshleniye, which means “thinking,” as in critical thinking. As citizens, and as journalists, we should all be so aware.